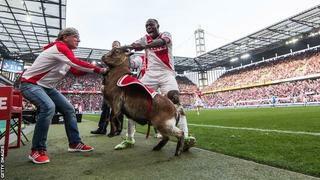 Nigerian international and FC Cologne’s striker, Anthony Ujah has issued an apology for grabbing the club’s mascot, Hennes VIII-‘the goat’ by the horns while celebrating a Bundesliga goal on Sunday, March 8. The 24-year-old attacker struck FC Cologne’s fourth goal in the 4-2 victory against Eintracht Frankfurt. But instead of celebrating his latest goal streak in his usual manner, the Super Eagle’s World Cup star ran to the touchline where the goat-Hennes VIII was tethered, grabbed the animal mascot by the horns and tried to drag it on to the pitch. 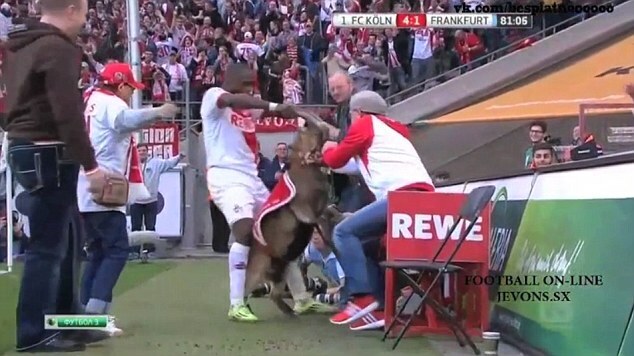 The animal’s handler was initially taken aback by Ujah’s actions but managed to quickly recover and pull the goat back before the forward returned to the pitch as Cologne celebrated their first home win since October. After a review of the bizarre incident after the game, the striker quickly issued a mea culpa statement: “Sorry Hennes. I was a bit too rough on him,” he wrote on his twitter handle @ujah_9 and Facebook wall. Thankfully, Cologne sports director, Joerg Schmadtke didn’t consider Ujah’s action much an offense. “Hennes is used to such stuff,” was his humorous reaction.